At some point in your brewing career you are going to become interested in taking your water chemistry to the next level. As part of that, you might come to the realization that you want to improve the quality of your water and stop using the water from a garden hose or you might want to cut down on the inconvenience of having to go to the store to get your water. A few hours to a day depending on how expansive you wish to make your system. $150-400, dependent on how complex you want to make it and how much capacity you want. After it was all completed, I had close to $300 in my system. I chose the iSpring RCC7 5-Stage system and I would highly recommend it. When I started brewing, I was buying Ice Mountain brand spring water from the grocery. In my opinion it was the best tasting water, so I used that for my brewing water. 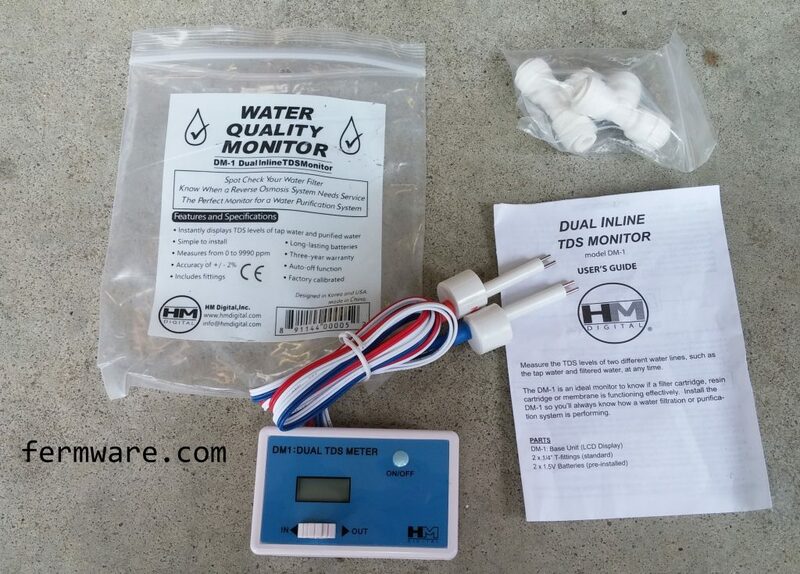 I then started dabbling in water chemistry, so I got an inline charcoal filter for my home water and got a WARD labs test done and used those results as absolute fact. It is well known that the water in Indianapolis is extremely hard. 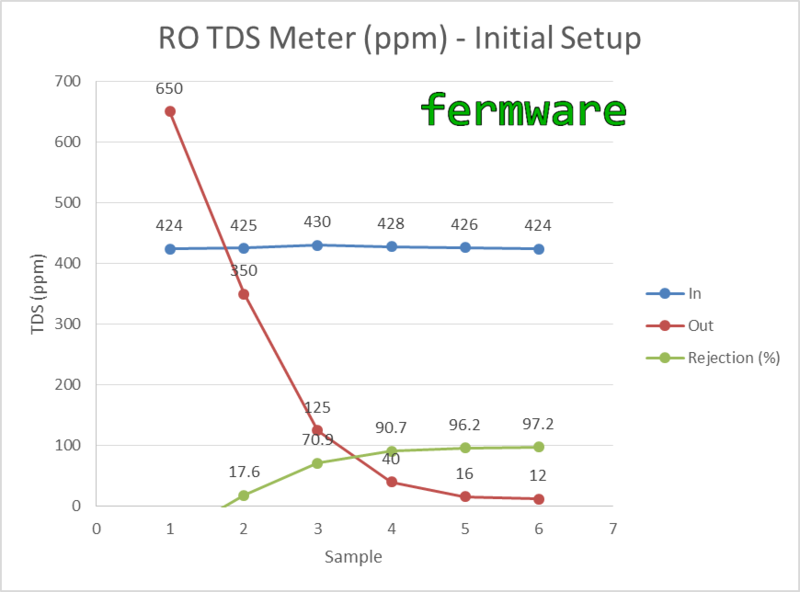 The WARD lab report showed a TDS value of 501 and a Total Hardness of 334. Of note, I submitted two samples and the charcoal filter did nothing for any of the measured levels in the water. I was naive and assumed that it would. They really just filter the chlorine in the water. I still would in most cases split my home water with a 50:50 mix of Ice Mountain and my home water. Of course my desire to simplify my process, I wanted to take one less trip to the grocery store out of my brew day prep. I had mostly decided to take the leap of installing an RO system. It was then one day having a conversation with a neighbor who works for the Indianapolis Water Company that cinched it. He was talking about the variety of sources for water that are available to Indianapolis Water and that those sources change often, even daily. Well, I might as well throw my water report out in the trash right? One thing I value in my process is repeatability. I don’t want to brew a batch of beer one time, then brew it again a year or so later and have it be completely different. One variable I can control is the water used in my beer. The best way to do that is to strip the water down to nothing, then rebuild it with mineral additions. One could argue that this is more complicated than just buying your water from the grocery store or the tap. Sure, but I heard in one podcast, paying attention to your water is the difference between a beer scoring 30 and one scoring 40. Plus, now that I’ve got my mineral additions routine worked out, it’s really like weighing out your hops, so no big deal. Mineral additions and how to do it is not covered in this post. However, if you do wish to go with a recommended profile and use Beersmith3, I have another post Beersmith 3 BJCP Water Profiles that shows how to add recommended water profiles for 72 BJCP water styles. This post will show how to quickly add these profiles to Beersmith3 so that you can use the built-in water profile mineral addition calculator. If this post helps you in selecting a RO system, please consider supporting this site by clicking on and purchasing your system or other products through the Amazon.com and other affiliate links in this post and on this website. Generally the filters are contained in one assembly. I’ve seen anywhere from 3 to 7 stage filters. The system I chose was a 5 stage. It seemed to be the most common and my most important criteria was that I would be able to get replacement filters easily and economically. I didn’t want to have a $45 filter that would have to be replaced every 6 months. These come in various sizes. The purpose of the tank is to store water for on-demand usage. With a limited flow rate for the filters to do a good job, you can’t just keep the faucet going non-stop. My system is rated at 75 gallons per day, which is just over 3 gallons per hour or just under 6 ounces per minute. Keep in mind that the size of the tank dictates how much water you can have on hand at any time. Also the quoted size of the tank isn’t necessarily how much water you’ll have available either. Mine is a 4 gallon tank that can hold 3.2 gallons. I’ve seen a 14 gallon tank that holds 10.7 and a 20 gallon that holds 14 gallons. Pretty self-explanatory. You need some way to get the RO water. There is pretty much a standard tubing size used for RO systems that appears to be the same as ice-maker tubing. It comes in a variety of colors, which you can use to your advantage if you like to keep things organized and color-coded. Permanent or portable? I had seen some of the portable systems and considered those, but since I was looking to spend a decent amount of money on an RO system, I figured I might as well enjoy the water beyond brew days and install a permanent system. Number of filter stages (more is better??). I chose a 5 stage system. The more stages, presumably a greater filtration level. My system quoted filtration down to 0.0001 microns. Availability and cost of filter replacements. Mine uses a standard size, but I’ve seen some that use smaller filters or larger capacity systems that use more expensive longer filters. All-inclusive kit. Most contain every component you need, but make sure you know what you are getting. Some come with tubing, some don’t. Mine was very complete with everything needed, except common tools. Holding tank size. Mine came with a 4 gallon (3.2 available), but I would prefer at least a 14 gallon that would have 10.7 gallons of RO water on hand at any point in time. Only having 3.2 gallons available to dispense at a time, means that when preparing for a brew day, I must empty the tank twice to get enough water for my all-electric Brewer’s Edge Mash & Boil’s 4 gallon batch sizes. Transparent filter cover for first stage. I liked this feature in the one I purchased, because it allows me to see when the filter will turn from a new white color to brown and rusty or whatever it will turn to. Daily throughput. Again, decide what your needs are. Ours is just for brewing and drinking water at two faucets. 75 gallons per day is completely sufficient for us. 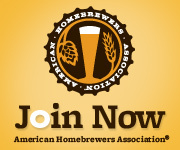 If you are starting a nano-brewery, you’ll probably need more. Do note that just like your beer tap lines, the further away you are from the holding tank / RO unit, you’ll experience much lower flow rates. Remember the concept of head loss from kegging 101? At our kitchen sink, the flow out of the RO faucet is just a nice slow flow, but in the garage, it’s almost like a hose! Essentially water comes in from the source, and goes through 3 pre-filters, then goes to the reverse osmosis membrane where the water is then split into waste water and RO water. Finally, it then either goes straight out to the faucet or goes to the holding tank reservoir. 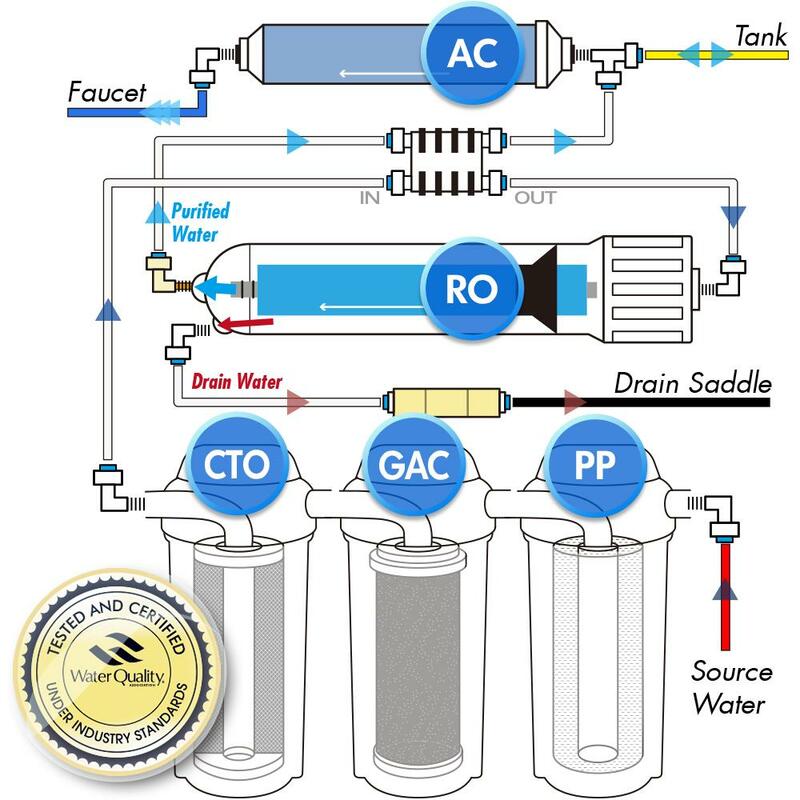 Stage 3 Carbon Block (CTO): pre-filter removes Chlorine, then reduces or entirely removes Pesticides, Nitrates, Herbicides, tastes, odor, and disinfection by-products (chloramines, THM, TCE), Volatile Organic Compounds (V.O.C). Stage 4 Reverse Osmosis Membrane (RO): This semi permeable membrane filters and rejects tiny impurities down to 0.0001 of a micron removing impurities such as colloid, heavy metal, dissolved solids, germs and other harmful substances. Virtually only water molecules and dissolved oxygen can pass through the Reverse Osmosis Membrane. The rejected contaminants are flushed to drain. The good output is now essentially RO water! It is important to note that part of an RO system involves some waste water. I haven’t measured it, but I’ve seen quotations that for every one gallon of RO water, the system will have rejected about 2.5 gallons of waste. If you live in an area where water conservation is at a premium, you need to take this into consideration. ASO Valve: This is the rectangular piece shown. It shuts the system off when the tank is full to conserve water. Stage 5 Post Activated Carbon Filter (PA): Post Carbon Final polishing filter for taste and odor. The final clean water will either go to the faucet for immediate usage or will go to the holding tank for future on-demand supply. After initially publishing this post, a user (rdcpro) on a Reddit thread had some good information on water recovery on commercial systems that I was unaware of. They indicated instead of a 25% recovery on home level systems, a commercial systems would be much higher (on the order of 90%). A 25% recovery would mean that for 4 gallons input to the system, you would get 1 gallon of RO water (1/4 = 25%). They are able to achieve this with much higher pressures. 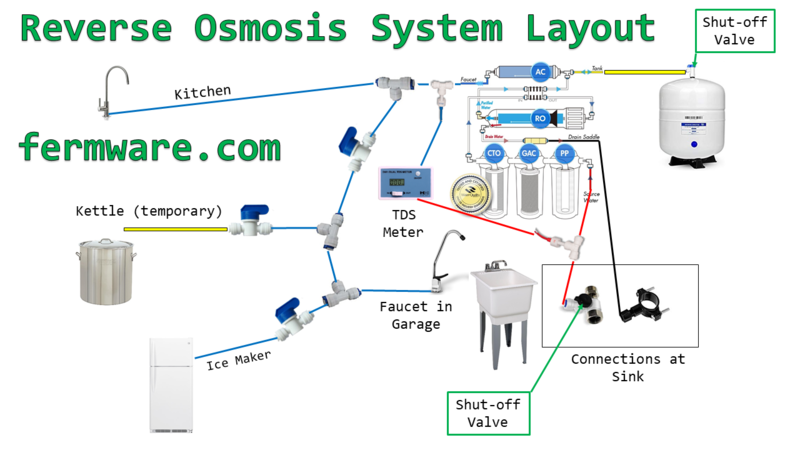 Here also is a much more technical link rdcpro provided on Reverse Osmosis systems if you are into that type of info. 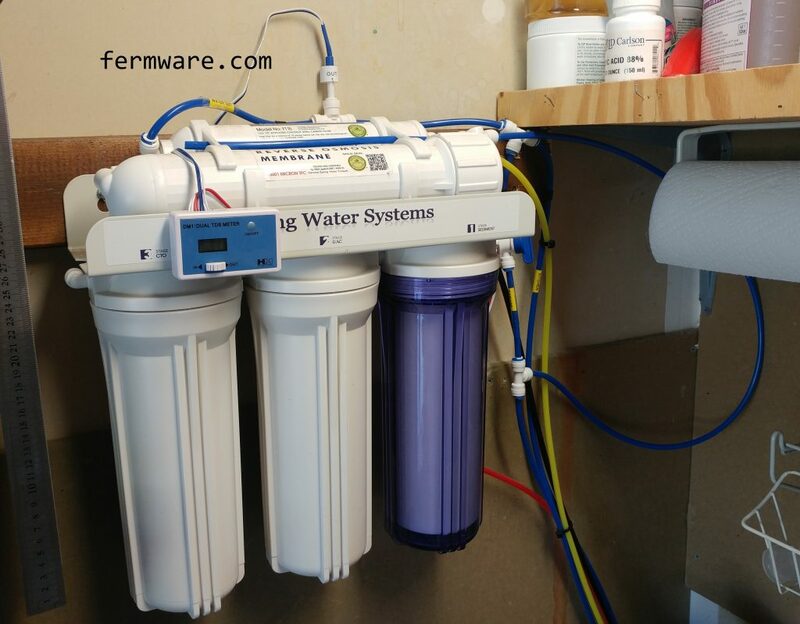 If you have a hard time justifying the wastewater aspect of a home reverse osmosis system, you could buy a pressurized system or look for creative ways to use the waste water. Some internet searches note collecting wastewater in a rain bucket for plants or watering the lawn. Keep in mind the wastewater will have high levels of the things you don’t want for drinking water. Here was the process to install my iSpring RCC7 system, but it should be a similar process to most other systems. 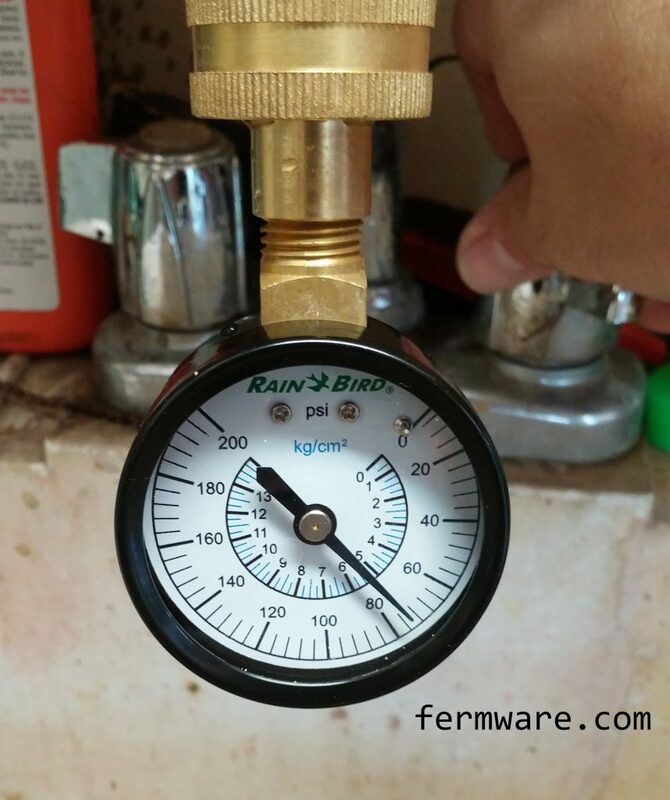 The first step in the instructions is to test the water pressure. This system required an input pressure between 45-70 psi. I measured mine somewhere in the mid-70’s at the time of installation. A little on the high side, but ok to go. Rather than install my RO system under the already overcrowded area under our kitchen sink, I decided to install ours in our garage. The main benefits were that when I do go to change filters, it will be significantly easier to replace them when they are at chest height and any spilled water won’t be a big deal in the garage either. I had to add an additional 2×4 to the wall to span 2 studs and provide a sturdy mounting surface for the filter array. This also provided some additional space between the filters and the walls, which makes removing and reinstalling the filters much easier. 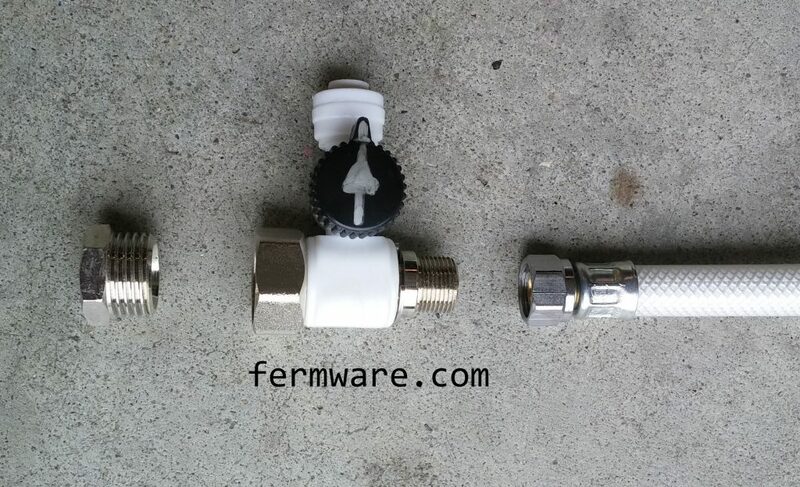 First off is an explanation of how the push fit connections work in an RO system. This video clearly shows what is happening inside the connector and demonstrates how easy they are to connect and disconnect. It is recommended that if you have a water softener, to pull the RO system supply from the softened water, rather than your hard water. The ion exchanged water coming from the water softener is apparently easier on the RO system than just plain hard water. Fortunately, our laundry tub in the garage was already plumbed for soft water on the cold side, so I just had to tap into the supply. My system also came with a feed water adapter, which made that easy. It also has an on/off valve in case you want to service the RO system without turning water off to the house. Fortunately, since my system came with color coded tubing, I was able to follow that scheme and just by looking at the hoses, I know each ones function. BUT, because I like labels, among the RO water lines (blue), I added labels showing their destinations. It just helps when needing to re-configure. 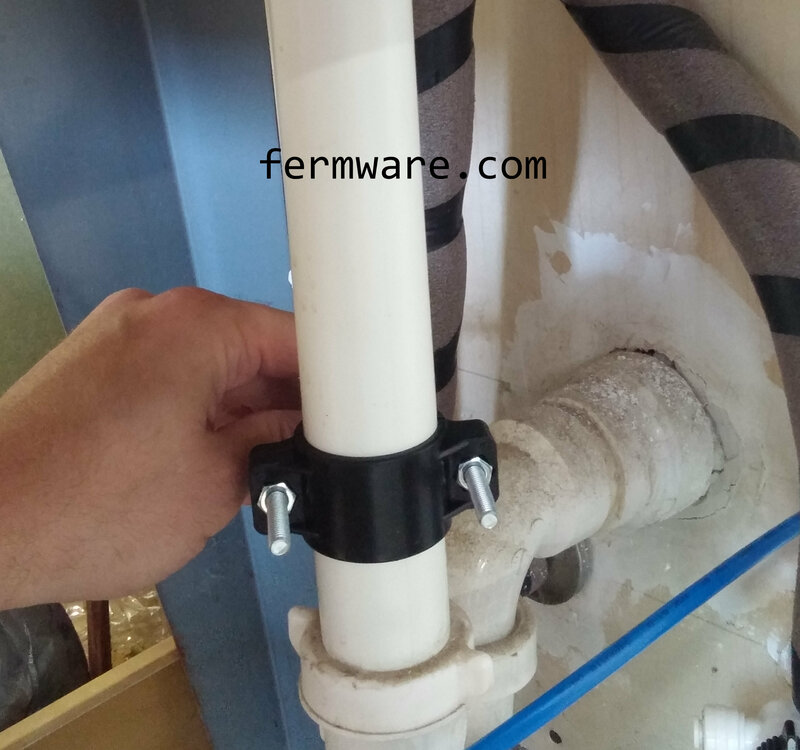 The other connection for the system is the waste water (black tubing), which requires drilling into your drain on your sink adding some foam and attaching a saddle connector. Again, since it was in the garage, this was more accessible. The last connection is the outlet. This was the hardest part for me, since I decided to run a line to the sink in the kitchen. I drilled a hole in the wall under our sink, which went to the crawlspace under our kitchen. I then ran this line through our crawlspace on up to the kitchen sink. The outlet also has branches to the ice maker for our garage fridge, an additional faucet on the laundry tub in our garage and a loose line that is used to fill my kettle (the whole point of this exercise). For now, I pull out a longer extension for filling my kettle so I don’t have to move it once filled, but I’m considering going ahead and making that line permanent so that it’s one less thing I’m setting up. One of my favorite add-ons for my setup is the HM Digital DM-1 In-Line Dual TDS Monitor. 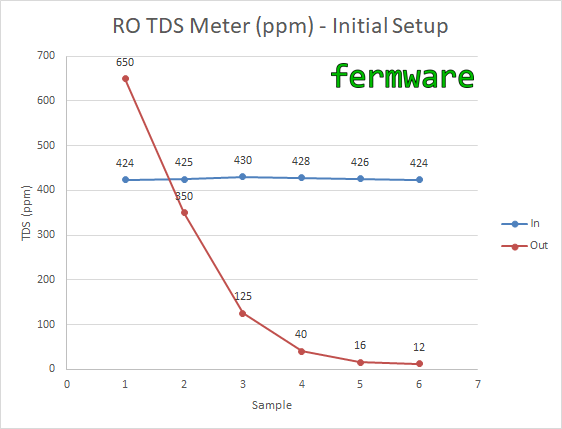 It is made specifically for RO systems to monitor the incoming TDS value and the outgoing TDS value. Here is a diagram of my system. You can see it has a few branches and valves to cut each section off. Right after installation, the manual recommends running a decent amount of water through the system to clear out any loose particulates in the filters. Here is a graph showing the cycles of water after installation. I basically let the system do it’s job filling the holding tank and drained it each hour and took readings. After about 6 tanks (19 gallons) worth of water, I was down to 12 ppm! I haven’t taken regular measurements, but here is a chart of the in/out over time since installation. When I first bought the system, I was accepting that I would be replacing filter sets every year. After seeing the measured performance of the system, I would say that after 2 years, there does not seem to be a noticeable difference in output, so I would consider the filters still operating properly. Another question that will come up during ownership or in the research phase is how often to replace filters. Several manufacturers seem to all state the same service interval based on time and not volume of water processed. 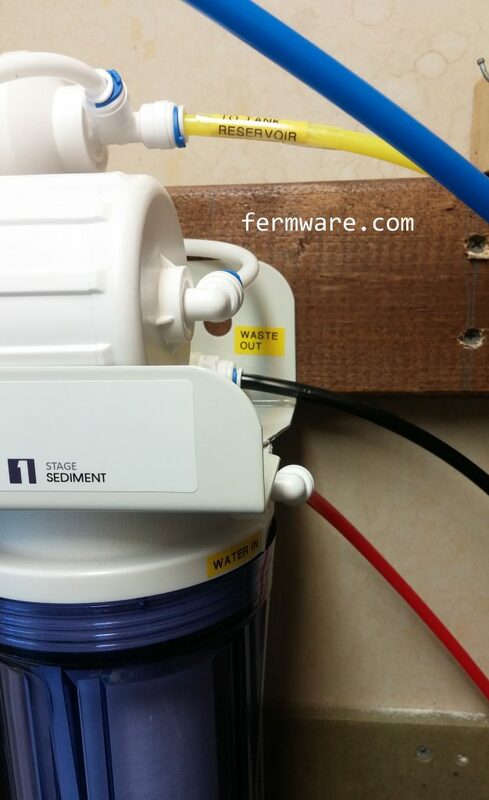 Stage 1 – Sediment filter, recommended change 6 months. Stage 2 and 3 – Carbon filters, recommended change 6 months. Stage 4- Membrane, recommended change 2-5 years. Stage 5- Carbon in-line filter, recommended change 6 – 12 months. 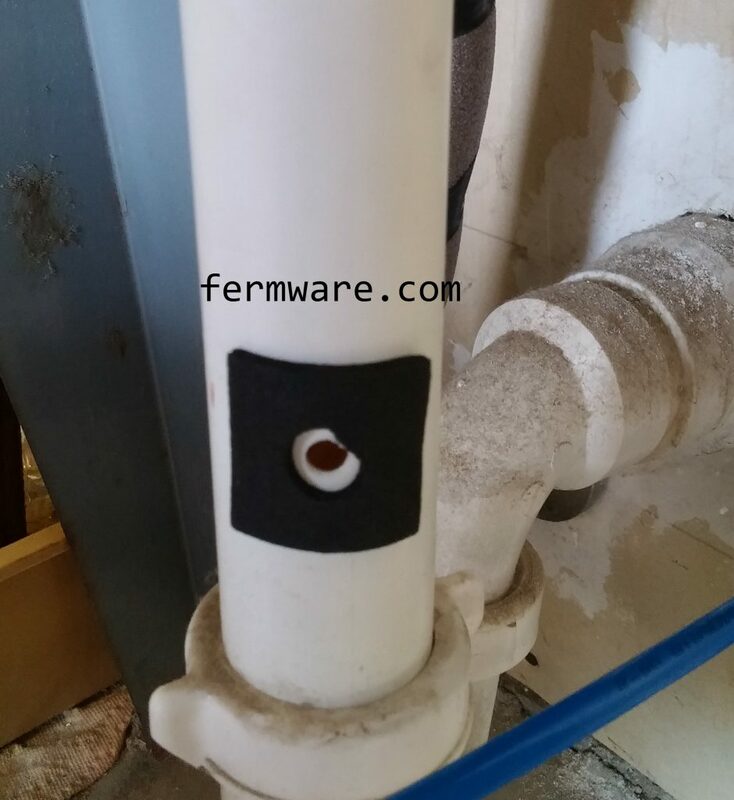 Various sites, including this one (WaterFiltersOnline), indicate to replace the RO membrane when rejection falls below 80%. That link also has a calculator for those that prefer not to math. Since I care about the overall PPM and not necessarily the rejection rate, I’ll probably replace all of the filters when I see a PPM close to 20. Using my average inlet PPM of 350 as a guideline, that would put me around 94% rejection. I’d consider that really early for normal recommendations, but since I’m going on 2 years with the original set of filters, I can stomach ~$50 for a new set of filters every few years. Below is my installation plot, but with a trace for rejection added. You can see the ramp up of the rejection rate as particulate in the new filters gets expelled from the system and the filters start doing their job. I did not show a chart of my long-term rejection rate, since it has been at 97% +/- 2% since I’ve been tracking it. I am extremely happy with the RO system as I have installed it. I’ve switched to drinking RO water exclusively around the house. I’d like to say that this has been able to shift my palette slightly in that I should be able to pick out more subtle differences in my beer. That could just be in my head however. 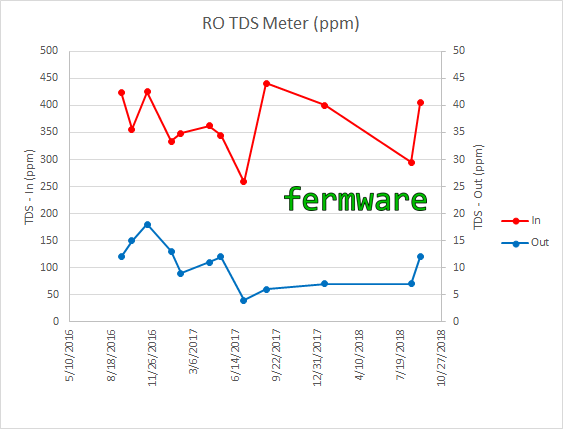 The TDS readings over time have shown the system to be working as intended and I’m quite happy with the filter performance over the 2 years I’ve had it installed. We now have RO in the kitchen, which besides clean tasting water, we use it exclusively for coffee and our electric tea kettle. The added benefit is that we now do not have to deal with mineral and lime build up on the heating elements. Also, my oldest daughter has been raising a Cape Sundew and a Venus Fly Trap on our kitchen windowsill, which are both carnivorous plants and they require RO water. Ever since I’ve installed the system, these plants have flourshed. These plants have also allowed us to make it through an entire summers with out any fruit fly break outs! Of course while working in the garage, I now also get to have a fresh ice water composed of RO ice cubes and RO water. If this post helped you in selecting a RO system, please consider supporting this site by clicking on and purchasing your system or other products through the Amazon.com and other affiliate links in this post and on this website.